A little while ago I went through all my old posts and did a little touch-up work, making all the pictures the same size, figuring out what allergy categories the recipes fit into, etc., etc. 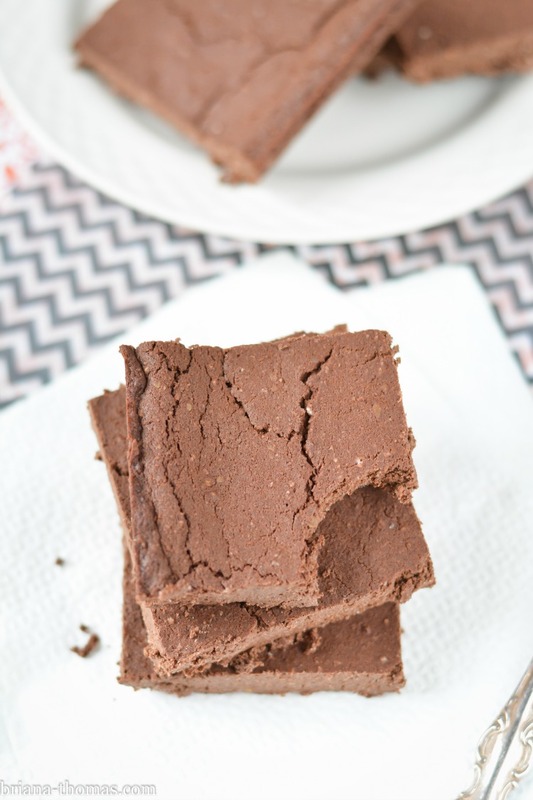 I stumbled upon one of my old brownie recipes, one that I made eons ago when I knew even less about food allergies than I do now, and was shocked to discover that with a few notes in the recipe, it could be gluten, egg, dairy, and nut free! “Wow, that’s pretty cool,” I thought. The only problem was that the recipe used ground unsweetened coconut flakes (i.e. homemade coconut meal). Which is OK if that’s all you’ve got, but since the advent of the large bag of coconut flour from Sam’s Club at an incredible price, I decided to remake these brownies with storebought coconut flour. Storebought coconut flour is much finer than homemade coconut meal, so this recipe has a much better texture. A really cool texture, in fact. My mom compares it to fudge. These brownies are really moist, which makes sense because there’s a lot of liquid in them. There has to be, because storebought coconut flour requires lots of “conditioners” when you’re using it to bake with. Otherwise your end product will be dry and gritty. Because of the unique properties of coconut flour, substitute at your own risk. You’ll basically need to recreate the recipe if using another flour. *Update* I have used my Baking Mix in this recipe with success. Notes for that are in the recipe below. These brownies are really simple to make, the recipe makes a nice big pan, and they’re CHOCOLATE y’all. While the brownies are good warm, they’re a little on the crumbly side and are best after refrigeration – both in taste and texture. Most people will probably want to use more sweetener than I did; I’m a dark chocolate fan so people often complain that I undersweeten. If you decide to add more sweetener, I suggest that you add more granulated sweetener rather than more stevia because too much straight stevia in chocolate recipes doesn’t taste so great for some reason (this is why most of my chocolate recipes call for a blend of sweeteners, or all granulated sweetener). If you want to eat these brownies warm with ice cream, might I suggest that you give this ice cream recipe a try? Or you could make a quick brownie sundae for yourself using this single-serve ice cream recipe. Allergy people, I’ve done my best to categorize my recipes according to allergy information. Of course, you should always double-check a recipe’s classification for yourself. My recipe categories can be viewed on this page (which also includes a bunch of other cool classifications, like collections of single-serve recipes, chocolate recipes, peanut butter recipes, s’mores recipes, etc., etc.). My favorite way to use this brownie recipe is to put chunks of it in this Mock Chocolate Xtreme DQ Blizzard. Simple amazingness. Question of the day (comment below! ): are you allergic to anything? If so, what was your hardest food to give up? You can pin this recipe from my Desserts board here. THM:S, Low carb, Sugar free, Gluten, Dairy, Egg, and Nut free | Allergy people, be sure to use non-contaminated ingredients | Be sure to properly measure your flours, spooning flour into a measuring cup and leveling off with a knife. Mix the almond milk, coconut oil, vanilla, and flax together. Whisk the dry ingredients together and add to the wet ingredients, stirring with a hand mixer. Add the warm water (this helps dissolve the coconut oil) and mix again. Taste and add more sweetener if desired. Spread into a greased 9x13 inch pan and bake at 350 degrees F for about 18 minutes. The brownies will look not quite done, but take them out and let them cool. These brownies are best served cold. You can omit the ground golden flax, oat fiber, and coconut flour and substitute ¾ cup + 2 T Briana's Baking Mix in its place. If you use the Baking Mix, bake for 21-22 minutes. 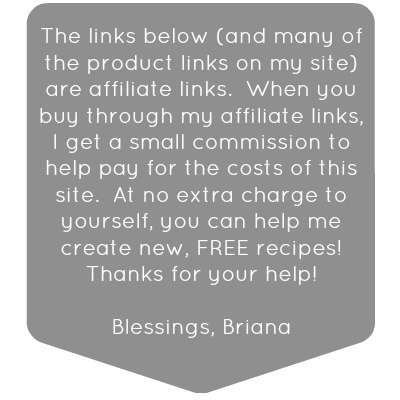 Please note that in order for the Baking Mix option to be egg/dairy free, you will need to make it with an allergy-friendly non-flavored protein powder. Briana, your allergy-friendly baking blend has given me hope that I can stick to a low-carb lifestyle. I have both peanut and tree nut allergies, so all of these amazing recipes with almond flour are out for me. I’m going to try this with your baking blend. Quick question – my husband is allergic to Stevia, wildly allergic. Do you think Swerve might work as a sweetener in these? I always recommend starting with less than you think you’ll need, then adding more and tasting as you go until you get it right. To make it cheaper, I substituted a bit over half the amount of coconut oil for butter. I guess I’ve had half a weeks worth of iron in one go! I have had a very hard time giving up cheese, but recently I’m beginning to realize I may be allergic to eggs. this is depressing because giving up eggs on a low carb diet deletes all the fun items, no muffins, no cookies, no breakfast casserole, no bread. I just want to give up. I ate PIZZA last night! just because I was so discouraged. These are in the oven. I put them in a 9 in. square pan and hope that baking them a few minutes longer will work. Can’t wait to try them. They smell amazing! How much vanilla extract should be used, instead of the 1 Tbs. of imitation vanilla flavoring? Thank you. If I don’t have xantham gum can I use gluccie? And is the golden flax ok to be omitted as I don’t have that either? Yes, you should be able to sub glucomannan for the xanthan gum. I do not suggest leaving the flax out as it helps act as an egg replacer. I haven’t worked with the Baking Blend long enough to know what the substitution ratios would be. I’m sure you could use the Baking Blend, but you may need more of it than the other flours called for. I made these but it’s as if the top layer burnt and it tastes terrible. I’m sorry to hear that, Leanne. If you followed the recipe exactly and baked them at 350 degrees F for 18 minutes, I’m not sure how they could burn. Be sure you’re baking them on the middle rack of the oven. Perhaps calibrating your oven temperature would be a good idea. I don’t have xanthum but could I use glucci? not sure what it does and would like to make in morning. The glucomannan should be fine (although you might have more trouble with it clumping, so whisk as you add it). Basically it just helps give you a smoother end product. Awesome! Thanks for trying it! can’t wait to try these sometime! I do not like the taste of coconut at all. Can I substitute some other flour for the coconut flour and still make the brownies come out right and still be healthy? Thank you. 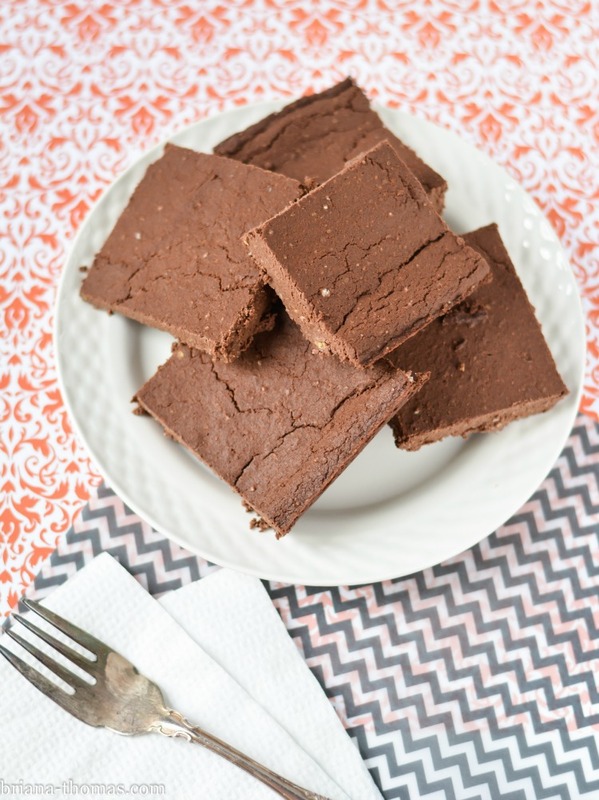 I don’t find that these brownies taste like coconut at all (coconut flour doesn’t have a strange coconut flavor, especially when paired with powerful flavors like cocoa), but if you don’t want to use coconut flour you could try substituting something like almond flour. Coconut flour and almond flour have very different properties though, and you’d need a lot more almond flour than coconut flour, so you’d have to do some experimentation with amounts.